Thank you for participating in the 2018-19 Destination Imagination season. We hope that your team has had a valuable DI Challenge Experience so far, and we appreciate your feedback regarding Global Finals 2019. We understand that there are some concerns surrounding the logistics of Global Finals 2019. From housing to food to shuttles, we have put together some highlights regarding the main questions we received. 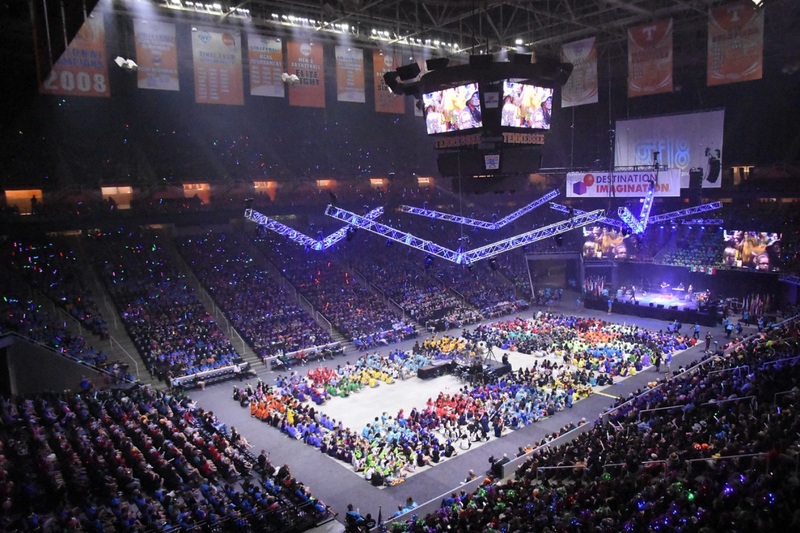 Destination Imagination will be offering an official event room block, which will be released to qualifying teams through a web portal called Passkey. Passkey looks like a typical hotel reservation site, but the rooms will only be available to Destination Imagination attendees. The reservations for these rooms will be managed in partnership with Visit KC. A credit card will be required to book these rooms. Rooms within these room blocks will vary in location and price. While Destination Imagination is still finalizing these room blocks, we can tell you that most prices will fall between $137-$170 ($154 average) per room per night, which includes taxes. We will be including taxes in any pricing posted so that you see a complete cost for planning purposes. We have reserved many double-doubles and single rooms with pull-out sofas to maximize occupancy. You may see different rates on third-party booking websites; those are not a reflection of the group rates that Destination Imagination will be offering. An informational housing document will be available in early spring on the Housing page of our website that outlines which properties will be available, how many rooms and rooms types, when the block will open for reservations, and amenities information like shuttles, free breakfasts, pools, parking, and more. The release dates for hotels will happen in two “waves” to accommodate teams certifying on a rolling basis. Those release dates for each property will be available in the informational housing document. Teams may also stay at hotels outside of Destination Imagination’s official event room block or utilize other accommodations like Airbnb. There will be many options for food during the event. Destination Imagination is currently working with Kansas City catering companies to determine a pre-ordering system for meals that will be available at the Convention Center. More information on pre-ordered meals will be available in early spring on the Food & Meals page of our website, and the pre-ordering of meals will have a deadline of May 1. In receiving preliminary bids from catering companies, we expect the cost for three pre-ordered meals a day to be between $36-40 per person. Some hotel properties will provide breakfast for free, eliminating that cost. Properties offering those amenities will be listed in an informational housing document available in early spring. The Convention Center is located in downtown Kansas City, Missouri, around a number of restaurants within walking distance at a wide variety of price points. There is also a downtown market with prepared foods and groceries that is walking distance from the Convention Center. Concessions will also be available at the Kansas City Convention Center and the Municipal Arena (where registration and select events will take place). It will be very possible (and actually easy, by design) to procure three meals a day without relying on external transportation to leave the Convention Center area. If you and your team decide to stay at the Convention Center to consume meals, there will be cafeteria-style places to sit and eat with other event attendees. Many hotels in the downtown area are within walking distance to the Convention Center and Sprint Center. For selected hotels that are not in the downtown area, Destination Imagination will be providing shuttle transportation. Some properties will be an easy walking distance from the Convention Center, some will be 5-20 minutes away with shuttles provided, and some may have no transportation provided for teams coming with their own transportation. For those who are driving, bus and car parking will be available for free on a first-come, first-served basis at the Liberty Lot, located half a mile from the Kansas City Convention Center. Destination Imagination will provide a shuttle to service riders from the lot to the Convention Center and back. Destination Imagination will notate the transportation amenities (like parking and shuttles) for each hotel property in an informational housing document available in early spring. It is also worth noting that the Convention Center is walking distance to and from the Sprint Center, where the Welcome Ceremony and Closing Celebration will take place. Kansas City has a streetcar that is free to ride. Running from the River Market on the north end to Union Station and Crown Center on the south, KC Streetcar is in walking distance of many hotels, restaurants, and destinations in the downtown area. Additionally, the KC Streetcar can transport teams from the Convention Center area to the Westin Crown Center, where Instant Challenge is located. The KC Streetcar runs every 10-15 minutes. View the Getting Around page of our site for more info. All of the Team Presentation Sites will have their own rooms this year, housed within the Kansas City Convention Center. The Kansas City Convention Center is located in downtown Kansas among many downtown hotel properties. It is walking distance (about five blocks) from the Sprint Center, where the Welcome Ceremony and Closing Celebration will be held. Inside and outside of the Kansas City Convention Center, there will be many spaces and activities where participants can meet one another and continue to foster the community associated with the Global Finals event. This includes, but is not limited to, two outdoor green spaces, cafeteria-like spaces, the prop storage exhibit halls, workshop spaces, and the pin trading zone. The Instant Challenge will be held at the Westin Crown Center hotel, which is located approximately a mile and a half from the Convention Center. The KC Streetcar (free to ride), can be picked up approximately four blocks away from the Convention Center and can transport attendees to Union Station, which is a block away from the hotel. Lastly, Kansas City has many attractions offered at low or no cost. Hallmark’s Kaleidoscope art studio is free to kids, as is the Nelson-Atkins Museum of Art, home to more than 34,500 pieces of art. View more FREE activities on Visit KC’s website. An up-to-10-ticket per team policy for arena seating in place for Global Finals 2019 is similar to the policy instituted last year. The goal is to ensure that students get priority seating, while also accounting for Team Managers and chaperones. We expect that most supporters arriving on Wednesday will be able to sit in additional festival seating available in the Sprint Center, but cannot offer guarantees until final registration numbers have been received. Stay tuned to our website. More details about the event will be posted in the coming months. If you have any further questions or concerns, please let us know. We are happy to help.